In a world of vectors and magenta lines, we rarely sweat the details of transition routes for instrument approaches. Follow the controller’s instructions and the GPS flight plan. Not much when you’re in radar contact and the navigator is working. However, both of those things can drop away without warning, so it’s worth digging into how you bridge the gap between the enroute environment and the final approach course on your own. It’s also an often-overlooked part of the IFR education. 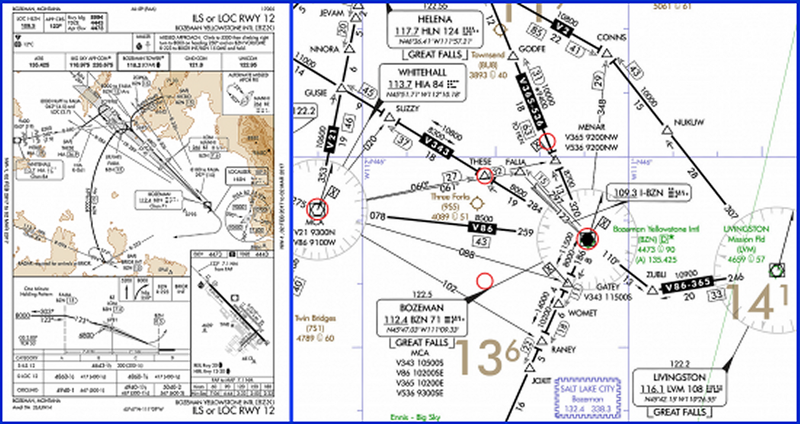 Two great charts to study are the RNAV (GPS) Y Rwy 12 and ILS or LOC Rwy 12 at Bozeman, MT (KBZN). Transitions connect a point in the enroute structure with a point on the approach chart. The RNAV (GPS) Y Rwy 12 has five: the Livingston VOR (LVM), the Whitehall VOR (HIA), GODFE on V-365, THESE on V343, and RANEY on V-343. So long as one of those five fixes are found along your cleared route, they should be available as a transition from the airway system to the approach. GODFE and THESE are the simplest: it’s 8000 feet direct to FEVIM, which is a track of 163 and 074, respectively. Note that the 8000 is an at-or-above altitude. If cleared for that transition, and barring any instruction from ATC otherwise, descent to 8000 is at your discretion. That’s why the wavy line and 18.5 in parenthesis at GODFE are worth noting. It’s 18.5 nm from GODFE to FEVIM, so you’ve got some time to descend. Note to iPad users with georeferenced charts: These discontinuities are not factored in when the airplane symbol appears over them on the chart. Your position is relative to the primary fixes on the approach. NoPT indicates that, so you won’t fly the hold-in-lieu-of-procedure-turn (thankfully acronymed HILPT). You’ll simply cross FEVIM and fly a course of 123 to HAYCI at (or above) 7300 feet. Did you expect the next fix after FEVIM to be OLENY? The step-down fix HAYCI kinda gets lost in the noise on this approach, which is why we brief approaches band ensure they match the way points listed in the GPS flight plan. 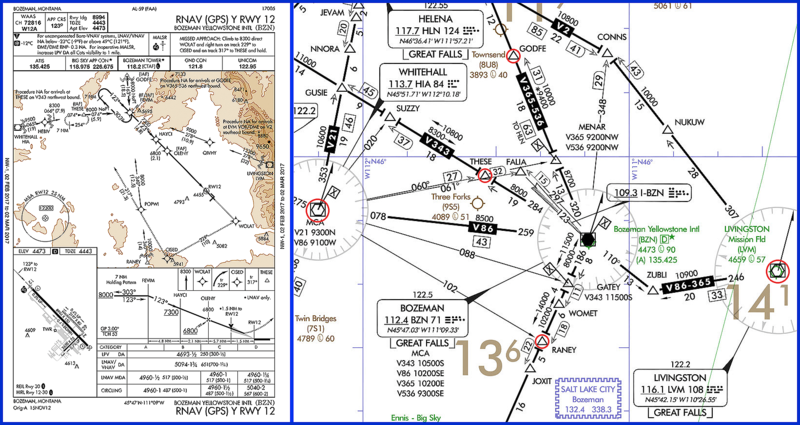 Moving clockwise on the transitions, LVM and RANEY are similar, but include a leg to a secondary RNAV fix (QIVHY and POPWI, respectively), and then direct FEVIM. The headings don’t change between the two legs, so they must be stepdowns for obstacles. Arrivals from these directions require a HILPT at FEVIM. The trip from HIA has three legs, the last of which is the transition from THESE. No surprise here. The ILS approach is more interesting. There’s a 15-mile transition from the Bozeman VOR (BZN) via R-297 to FALIA, with a HILPT. For equipment, only a basic VHF nav/com and a timer is required. There’s a transition from HIA to THESE with two legs. The minimum altitude is 9400 feet for the first 19 miles, delete denoted by the 19 inside the D-shape (for “distance” or “DME”). The minimum altitude for the next 7.9 miles is 8300 feet. Both legs follow R-060 from the VOR. If you’re using GPS, the fix where you can descend to 8300 feet is HEBIV (hiding there between the two discontinuity symbols). Because GPS navigation is not required and you might be navigating using VORs, the intersection is defined by R-060 from HIA and R-284 from BZN. THESE is also a named fix on V-343, so you could get there via VORs along the airway. The route THESE to FALIA has a note that requires some parsing: “8000 NoPT to FALIA 042° (4.5) and LOC (2.7).” With a GPS it doesn’t matter. You’ll see THESE, CFFFB, FALIA in the flight plan. CFFFB is a Computer Navigation Fix. It’s shown in parenthesis because your GPS knows about it, but controllers don’t. Its only purpose is allowing a GPS to navigate point-to-point. The missed approach has a similar dead reckoning leg. You climb on runway heading to 5200 feet, then turn to a heading of 250 to intercept R-223 from BZN as you continue to climb for 8000 feet to BRIGR. BRIGR is also an initial approach fix (IAF) for this approach, with a DME-arc transition. The note says that RADAR is required to use this fix, and a glance at the enroute chart shows why: BRIGR isn’t on an airway. Without an RNAV system, vectors are the only way to reach BRIGR. If radar coverage was down and you had a GPS, could you fly to BRIGR on your own? Probably not. Off-route clearances require radar coverage (for the most part). When flying the arc with GPS, you’ll get an annunciation from the navigator when it’s time to turn inbound and intercept the localizer. Without GPS, you might start your turn inbound to the localizer when you cross R-289 from BZN. This is the lead radial, marked “LR-289” on the chart. And, yes, it’s perfectly legal to fly this with one nav/com. Cross R-289, start a half-standard-rate turn to the right, tune the localizer frequency, ID it, and intercept. Lead radials get more important the faster you’re moving over the ground. Below 150 knots, you can usually ignore them. There’s also a DME arc from KICDO. There’s no radar requirement, even though you won’t find KICDO on the enroute chart. The key is that KICDO is on R-320 from BZN at 15 miles. R-320 also defines V-365 from BZN. This means KICDO is on V-365 two miles north of MENAR (the one with the crossing restriction flag). It’s typical to find a common named fix on both the enroute chart and the approach chart, but it’s not required if the fix on the chart lies directly on the airway. This is why details matter. Sometimes it takes a little investigation to understand how all the transitions connect. Make a habit of investigating and you’ll be ready on the off day when you must put that knowledge to use. Both the GPS and Localizer-based approaches to Runway 12 at KBZN have a HILPT (hold in lieu of procedure turn), but they’re defined differently—which makes a huge difference, at least on paper. When a procedure turn is depicted as a hold, you must fly it like a hold. No “creative” turns are allowed. The ILS shows a one-minute leg length, so you’ll follow standard practice and fly outbound for enough time that the leg coming back inbound is about a minute. The RNAV approach measures the HILPT in distance. These are at least four miles, but the length increases with altitude. This HILPT is seven miles. The GPS guidance will bring you out far enough to fly all seven miles back inbound. That’s a 10-minute course reversal for a typical trainer. You might need long-range fuel tanks. Except you don’t need to fly all seven. This isn’t a hold, it’s a HILPT. AIM 5-4-9 even allows for this: “… the specified leg length/timing must not be exceeded.” So remain within the bounds of the racetrack and use an approved hold entry, but feel free to cut the distance short and save a little gas. Most GPS navigators even understand and sequence to the next fix automatically. A. Yes, and it provides an arc just like a certified GPS navigator. B. Yes. However, it’s an approximation of the arc using several short, straight segments. C. Not really. The arc appears as a discontinuity in the procedure. D. No. However, the flight plan connects the two points in a straight line so it will resume normally after the arc is complete.